Poland once had a Jewish population of three million, 90% of whom were killed in Hitler's Holocaust. But after decades of conversion to Catholicism and emigration, a Jewish revival is beginning. Wearing his yarmulke (Jewish head covering), long beard and ringlets it's hard to believe that Pawel Bramson was once a skinhead. 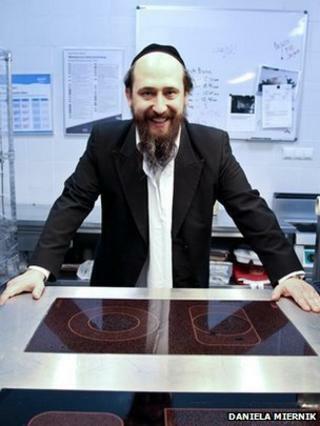 Now he is a shochet - a slaughterer who kills animals for kosher food in accordance with Jewish religious law. For a short time in the 1990s, he and his skinhead friends in Warsaw saw Jews and other minorities as the enemy. "Did we go out on the street and cause trouble? Yes we did. If we saw a black guy walking down the street we used to chase him. If we caught him, we did what we did. It's so difficult to say where this hatred came from. I can't explain it myself," he tells the BBC. Mr Bramson, 36, cannot even remember ever seeing any Jews on Warsaw's streets at the time. "It was madness, because we didn't know anything about Jews or Jewish culture. There were just slogans, like 'Jews rule the world', 'Jews are bad, they own all the property', those kind of things. A young person always needs to find an enemy," he says. Born into and raised as a practising Roman Catholic, he made a discovery at the age of 24 which turned his life upside down. A friend had told his wife, Ola, that she was Jewish, and when she began working through the archives she discovered by chance that Pawel also came from a Jewish family. "It was the biggest shock of my life, apart from when my son was born. It was really like a huge blow. For most of my life I had hated them and at a time when I'd only just begun to learn to tolerate them I discovered that I was also Jewish. It was too much to take in at once," he says. Mr Bramson's parents were assimilated Jews who had become practising Catholics. "I went to my parents and said, 'Hey, I've got these documents, why did you never tell me?' Later they confirmed it was true and that's when I started to go to the synagogue to learn more. "I found out that my grandfather was twice in German labour camps. Other Jews died in concentration camps, so now I need to cultivate my knowledge and keep in mind the memory of my ancestors," he says. His decision to become an Orthodox Jew caused difficulties with his parents who chose to remain practising Catholics. His case is just one of thousands that have come to light following the end of communism in 1989, Poland's chief rabbi, Michael Schudrich, says. "It's far more common than people are aware of, it's probably in the thousands at least. We have had support groups and certainly people have been shocked. The overwhelming majority of people come to peace with it. It's not simple, it takes patience," Rabbi Schudrich tells the BBC. Jews have been living in Poland side by side with their Catholic neighbours for almost 1,000 years. By the 1930s the community numbered more than three million, the largest in Europe. Poland was then a multi-ethnic society with large numbers of Ukrainians, Belarusians, Jews and Germans. That society was destroyed during World War II. The Germans murdered 90% of Polish Jews during the Holocaust. At the end of the war Poland's allies, the Soviet Union, US and Britain decided to shift the country's boundaries westwards, forming a homogenous Catholic country governed by a communist system imposed from the outside by the Soviet Union. "Due to the lack of central authority in Poland just after the war there were gangs of Poles who were killing Jews in the couple of years just after the war. Horrible, horrible murders, 1,500, 2,000 people. It made a huge spiritual and psychological impact saying, you know, we're still not safe and so people said, either I leave and if I don't leave Poland I leave Judaism," Rabbi Schudrich says. Thousands of Holocaust survivors chose to leave, emigrating to Israel or the US. Jews who stayed were often communists who believed in the power of the system to transform the country. But anti-Semitism was also used as a tool by the communist authorities. More than 20,000 Jews left Poland after an anti-Zionist purge led by the Politburo in 1968. Now, it's estimated there are just 20,000 people at most with Jewish roots left in Poland. Since 1989 there has been a gradual reawakening of interest in Poland's Jewish history and culture. Now there is a large annual Jewish festival in Krakow that attracts thousands of international visitors, and Jewish film and literature festivals. Yiddish and Hebrew classes are popular and Poles have taken it upon themselves to look after some of the thousands of Jewish cemeteries across the country. Polish prisoners even take part in such community schemes on a voluntary basis and Rabbi Schudrich visits prisons to give talks on Jewish history and culture. Warsaw's Tslil choir sings in Hebrew and Yiddish. Most of the members, like Marta Wesolowska, are not Jewish but they feel a special connection to the music. "I think this is really quite exotic for us but very deeply rooted in the Polish tradition. Jewish music was a part of Polish culture for hundreds of years and after the Second World War it was destroyed and we try to revive this tradition," she told the BBC. Poland is still viewed from outside as a giant Jewish graveyard, the place where the Germans built the death camps Treblinka, Sobibor, Belzec and Auschwitz. It's an image Rabbi Schudrich has spent decades trying to change. "Until 1989 no one was aware that so many Jews were left in Poland. People could have realised it but they didn't, so there was an image that it was all over here and that's the image I heard when I came here in the '70s and it took me a while to realise it just simply is not true. "Stereotypes change very slowly, so it's a process, for me it's a painfully too-slow process," he says.